It is a sad reality that even in 2019 there are people in Manchester who still face hostility and prejudice. This is unacceptable and Manchester City Council is fully committed to rooting out the perpetrators of hate crime and ensuring the city is a one of acceptance. Manchester has a proud tradition of inclusivity. It was a bastion of the LGBT movement in the 1980s leading the way in championing people’s rights to live free from intolerance. And as an ever expanding multicultural city celebrations are held every year to honour the religions and traditions of the communities which make Manchester special. In spite of the tremendous progress which has been made over the past three decades there is work still to be done. 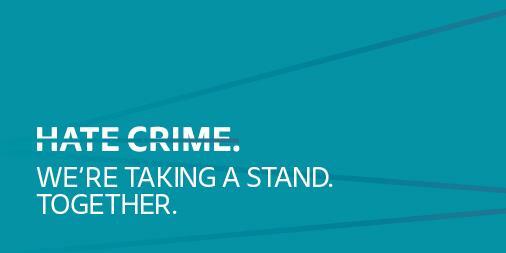 Hate crime cannot be tackled by the police alone, which is why this year we are calling on all Mancunians to pledge not to stand by if someone is attacked, simply for being who they are. A born and bred Mancunian, Mr Whittaker explains his experience of a homophobic assault in Manchester City Centre which took place two weeks ago. Councillor Bev Craig, lead member for LGBT Women, said: “Hate crime can take place any time anywhere and no one should have to face being abused as they go about their daily life. We have already achieved so much in becoming a more tolerant society, but as Hate Crime Awareness Week shows, we can always do more. Hate Crime Awareness Week will run from Monday 4 February - Sunday 10 February. There will be more than 100 events taking place across Greater Manchester to promote the week of action.